Fan Fest and the London Film Museum have teamed up to bring us Fan Fest - The Ultimate Spy And Sci-fi Event. Although this is not an official Bond event but looking at the programme it promises to be the biggest and best Bond related event this year, as well as a must visit for film fans. Fan Festival is proud to present their first collectors convention and signing event at the London Film Museum in County Hall. The weekend of the 24th and 25th April 2010 will be packed with opportunities to meet some of your favourite actors and actresses from the movie industry. Stars of the British film industry will be on hand for signings among the collector’s tables and exhibition pieces on display. 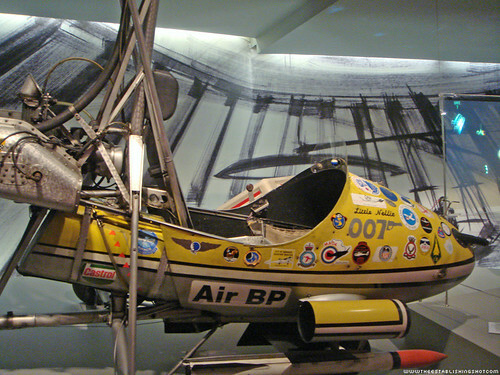 Little Nellie – The autogyro from You Only Live Twice. If you didn't see my previous Bond 23 catchup post, this is an excerpt regarding Nellie. "Whilst chatting to the London Film Museum team (@ldnfilmmuseum) it was mentioned that Little Nellie (James Bond's Gyroscope from You Only Live Twice) had arrived for Fan Fest and was in the building. No need to mention that my anticipation level for Fan Fest shot up. With the lineup they are programming Fan Fest may be the best film event this year." From Iron Man – Tony Stack’s prototype suit he uses to escape the desert as worn by Robert Downey Jr.
To celebrate the launch of Clash of the Titans we shall have original props and costumes on display.